This chart book provides an outline of the major issues and themes in Bible prophecy. It is designed to appeal to non-specialist readers, yet in its detail and comprehensiveness it also serves the specialist well. While there are many books on prophecy, the vast majority deal with the subject from a particular perspective and tend to dismiss other views. This book seeks to be even-handed and to avoid prejudicing readers for or against particular points of view. 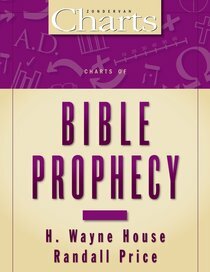 About "Charts of Bible Prophecy (Zondervan Charts Series)"
This new addition to the ZondervanCharts series of reference tools, Charts of Bible Prophecy, helps the student and specialist alike navigate through the many issues, themes, and especially different viewpoints of Bible prophecy. While most books on prophecy deal with the subject from one particular perspective and tend to be dismissive of other views, Charts of Bible Prophecy brings the differing views together in an even-handed way for side-by-side comparison. The 120 charts contained in this volume fall into the following groupings: An Introduction to Prophecy Hermeneutics and Prophecy Fulfillment of Prophecy Prophetic Texts Systems of Eschatology The Rapture and the Second Coming The Nation of Israel Teaching on the Tribulation The Olivet Discourse Teaching on the Millennium Daniel and Revelation Death and Afterlife Comparative Eschatology. Prophecy and Archaeology ? Development of Antichrist Typology ? Messianic Prophecies Fulfilled in Christ ? Three Stages of Dispensationalism ? A Survey of the Second Coming ? The Temple of Israel in Islam You'll find all of these topics among the 120 charts in Charts of Bible Prophecy. Dealing with prophecies of the Bible and the doctrines and issues that surround them, this book lays out important information clearly and concisely, furnishing both general Bible readers and specialists in Bible prophecy with the learning advantages of a visual format. The charts are arranged under thirteen headings: 1. An Introduction to Prophecy 2. Hermeneutics and Prophecy 3. Fulfillment of Prophecy 4. Prophetic Texts 5. Systems of Eschatology 6. The Rapture and the Second Coming 7. The Nation of Israel 8. Teaching on the Tribulation 9. The Olivet Discourse 10. Teaching on the Millennium 11. Daniel and Revelation 12. Death and the Afterlife 13. Comparative Eschatology Regardless of your stance on Bible prophecy, you'll appreciate this volume's evenhanded approach in presenting and comparing different viewpoints. H. Wayne House (Th.D., Concordia Theological Seminary, JD., Regent University) is distinguished professor of biblical studies and apologetics at Faith Seminary, Tacoma, Washington, and a professor of law at Tinity Law School, Trinity International University. He is the author of numerous books, including Charts of Cults, Sects, and Religious Movements, and Charts of Christian Theology and Doctrine. Dr. House is past president of the Evangelical Theological Society. He and his wife Leta reside in Silverton, Oregon. Randall Price (ThM, Dallas Theological Seminary; PhD, Univeristy of Texas at Austin) is Distinguished professor of Judaic Studies and Executive Director of the Center for Judaic Studies at Liberty University. He has also done graduate study at the Hebrew University of Jerusalem and has conducted archaeological excavation in Israel. He has served as a pastor and college professor and is the author of numerous books and commentaries on the Bible. A summary of the history, leadership and theological views of the major sects, cults, and religious movements in the US. 320 pages, from Zondervan.